Articular cartilage injuries are frequently encountered in the setting of a multi-ligament injured knee. Despite the typically higher energy mechanism, chondral injury patterns seem to be similar to isolated anterior cruciate ligament injured knees. Current treatment management of the multi-ligament knee often includes surgical intervention with repair and reconstruction within three weeks of injury. In this setting, it can be quite difficult to determine if a chondral or osteochondral lesion is symptomatic. Since we still do not have an understanding as to the natural history of most chondral lesions, it can be impossible to determine which lesions will cause persistent symptoms and which will remain asymptomatic. No studies have evaluated concomitant multi-ligament surgery and articular cartilage restoration procedures. It is our experience that only a small subset of these lesions may cause persistent symptoms directly attributable to the defect. However, this subset may benefit from articular cartilage procedures in a delayed fashion. 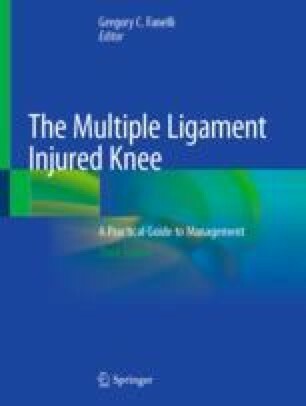 Acute and secondary treatment considerations must stress minimizing morbidity in the setting of the multi-ligament knee. Unfortunately, the development of progressive degenerative changes may occur regardless in this setting. This degenerative course may be multifactorial and not primarily attributable to acute chondral injury. Many patients may ultimately require an arthroplasty to address their advanced post-traumatic arthritis.